I just discovered this book this afternoon--and I think it may be a must-read over the next few weeks! I'm not sure how the new year has kicked off at such a hectic pact--but, it certainly has! 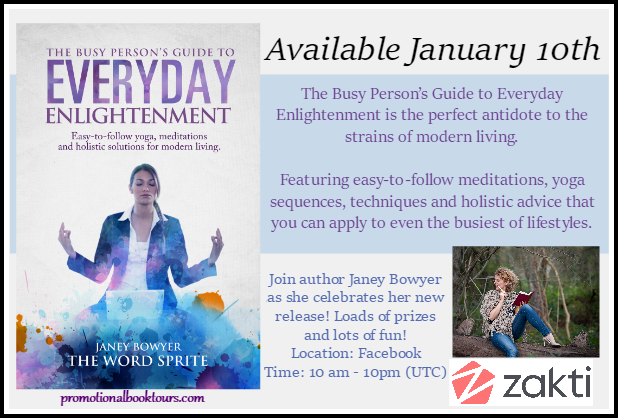 I wanted to share The Busy Person’s Guide to Everyday Enlightenment by Janey Bowyer. Learn a bit a about this book (set for release on January 10, 2016)--and enter to win the author's giveaway at the end of this post! About the author: I grew up on a hill in the north of England. From a young age, I wanted to live in London. As a child, during the depths of night, I'd often listen to the hum of passing trains. Sometimes I'd run to my bedroom window hoping to catch a glimpse so that I could pretend that I too was travelling on one, speeding along, London bound, like the rest of the world was sleeping. In my novel The Last Days of Lisa, (that I’m still writing), the main character Lisa mirrors how overwhelming it was for me to see London for the first time through the eyes of a teenager traveling alone…. As for yoga, another book in the form of a second-hand yoga book written back in the 1960’s made its way into my mitts via a second-hand bookstore. As I’d said earlier, to start with I wasn’t very good at either. Dyslexia and lack of flexibility and poor posture were my obstacles. I could see beyond that though as both yoga and writing offered me hope and possibilities that before this I hadn’t ever thought possible. Before yoga and writing I believed I was useless and had nothing to offer the world. So I worked hard at studying for more than a decade. The author John Harding was the first teacher to believe in me. After studying writing under his inspiring tuition, I even managed to get a few novels published along the way. On the yoga side, I studied both Hatha and later Kundalini yoga and despite not being naturally flexible nor a person who liked to sit still. It was in India back in 2004 that I had my first awakening experience. During all this time, I also managed over the years to work my way up from an office junior job to a finally a supervisor position, having worked for most of my life in a string of unfulfilling office jobs. The good news that in October 2015 I left office work to become The Word Sprite full time!